"A chocolate and orange piece of heaven, great with strawberries and cake for dipping! For best results use a chocolate that is at least 70 percent cocoa." Heat the cream and orange juice in a saucepan over medium heat until it starts to bubble at the edges. 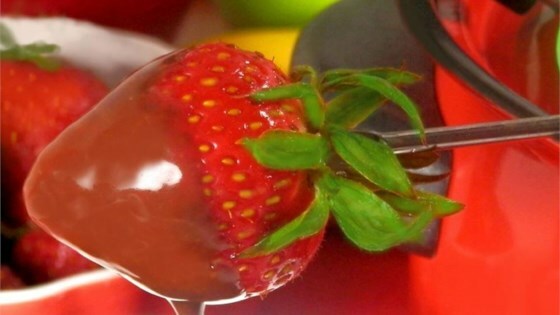 Remove from the heat, and immediately whisk in the chocolate, orange zest, and orange liqueur until smooth. Serve in a fondue pot over the lowest heat setting, or farthest from the heat source. Watch how to make authentic French mousse au chocolat! This was excellent. It was a bit more liquid than I would like but the taste was phenomenal. Awesome! Everyone who has tried this has loved it! I increased the amount of orange liqueur to boost the flavor. Very good, and easy. I used a bag of Ghiradelli semisweet chips. The fondue was thin at first, but thickened over time in the fondue pot. This was AWESOME! And EASY! I did not have orange liqueur, but used orange extract that I had on hand. I cooked it on the stove and then transfered it to the fondue pot for dipping.